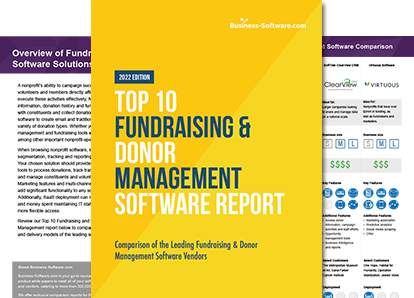 Does your nonprofit need help managing donors? Review top solutions for free. Need accounting software for your nonprofit? Browse leading vendors for free. Like nonprofit organizations come in all shapes and sizes, so do constituent relationship management (CRM) solutions. Depending on their scale or their assortment of features, donor management may or may not fit an organization. In this post, we feature five different nonprofit donor management solutions and how they benefit their own breed of organization. CRM software with donor management is the non-profits' lifeline. At its core, CRM software with donor management for nonprofits tracks donor relationships and optimizes fundraising strategies, ensuring your business thrives by moving as a unified organism toward a singular goal. Nonprofits require specialized products to address their range of financial, marketing and client relationship management needs. Yet oftentimes these industry-specific solutions are unreasonably priced for the companies that need them most: charities with minimal personnel operating on tight budgets. We talked to Dennis Mueller, co-founder of DonorSnap, about how the company got its start, his exasperation with the layered pricing models of other specialized nonprofit solutions, and why he was such a stickler about DonorSnap's simplistic pricing plan. Trust is a precious commodity in the nonprofit sector. 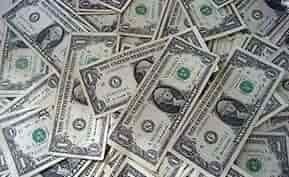 But in order to inspire trust in donors, financial transparency is paramount. With widespread stories of funding misuse, donors are more cautious than ever. This raises the bar for nonprofit accountability and requires organizations to maintain accurate and easy-to-access financial data. 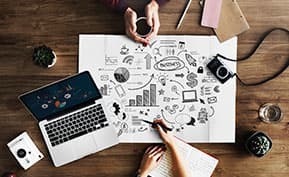 For nonprofit organizations, finding the best nonprofit accounting software is a vital component of the organization’s potential success. 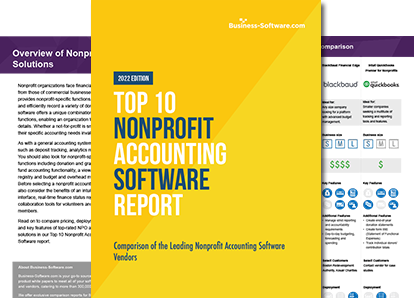 These 6 nonprofit accounting software solutions manage fund accounting, track donations and more. Looking for the best nonprofit accounting solution for your organization? You aren't alone. We answer the popular question from our community members, sharing how nonprofit financial software differs from normal accounting software and how to find the best. 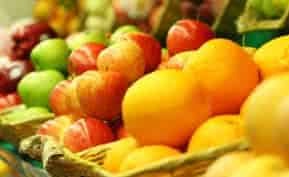 If you are someone involved in the financial aspects of a nonprofit organization, then you know all about the various challenges that surface on a daily basis. From managing donations and recording pledges to accepting in-kind donations, nonprofit accounting software solves the unique financial challenges NPOs face. It can be tough for nonprofit organizations (NPOs) to find a single software solution to solve a vast array of nonprofit-specific issues. Thankfully, Abila's Nonprofit Online is a comprehensive all-in-one nonprofit software solution built to handle grant management, fund accounting, donor management and more. From the Community: Looking for a Scalable Solution for a Not-for-Profit? Crowdfunding is an easy way to promote a business, charity, product or natural disaster and has become increasingly popular with the rise of social media and internet use. Sites such as GoFundMe, Indiegogo, FundAnything, and many more allow people to create donation campaigns about themselves, someone they know or an organization they support. 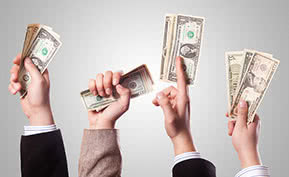 Here we take a look at five crowdfunding platforms. 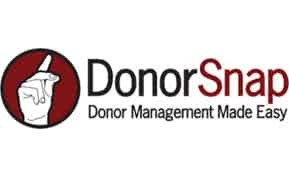 DonorSnap is donor management and fundraising software that tracks all contacts, donations, members, pledges, volunteers, and event registrations. 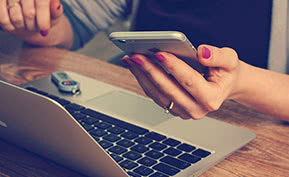 The platform is equipped with toolsets focused on contact management, donation management, reporting and communication, is available as a mobile application, and allows users to customize the dashboard interface to include or exclude any applications in order to streamline day-to-day processes. Abila Nonprofit Online is a full nonprofit software solution that can take care of grants, CRM, finances, and fundraising. 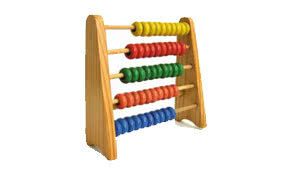 For accounting, the program displays all transactions and budgets and can generate what-if scenarios for your finances. Blackbaud CRM is nonprofit constituent relationship management software that unifies constituent data across all departments and offices, provides users with cohesive views of all constituents and enables users to access information stored in the company database as well as in a mobile environment. The software is equipped with alumni management tools, supports membership growth and manages recurring giving programs. StratusLIVE Fundraisers Suite is a CRM and fundraising software solution designed for use by nonprofits. The CRM portion of the program is based off of Microsoft CRM and works with volunteer and donor data, allowing users to access all of it from any web-enabled browser, track interactions, and pull up donation information. SofTrek ClearView CRM provides constituent relationship management, reporting, online marketing and operational tools for your nonprofit organization. ClearView CRM not only tracks meaningful donor information -- it follows campaign activities, manages opportunities, and helps plan strategies to take advantage of those opportunities. Business intelligence and reports are detailed, allowing users to track and grow donor relationships. ClearView CRM also manages staff in addition to anything pertaining to fundraising efforts. ClearView is available as a web-based or mobile solution, with customizable dashboards. DonorPro CRM is the premier provider of fundraising and donor management software solutions for the nonprofit sector enabling organizations to reach more constituents, raise more money, and operate more efficiently. With DonorPro's suite of solutions, nonprofits can manage their constituent database, track donations and more.